After two seasons of gross under-achievement, Valencia seem to be returning to the top of La Liga under the meticulous coaching of Marcelino. The new coach has quickly instilled his principles into a team full of talent after the club significantly strengthened their squad with some clever signings and exciting academy graduates. Playing out of Marcelino’s characteristic tactical template, Valencia seem to be building towards something very interesting. Valencia have a very young squad filled with pacey and technical players which is perfect for Marcelino’s liking. For the purpose of this article, we’ll look at three distinct tactical strategies put in place by the coach which perfectly suits his players skill sets of speed and technical quality. Despite a small sample of games thus far, it’s already clear that these are three principles in his tactical approach we’ll see throughout the season. Defensively, Marcelino has Valencia in a very compact, positionally-focused 4-4-2. The team moves in unison both horizontally and vertically to maintain their compactness. Focus is on their positioning depending on the position of the ball and their teammates. There could be occasions of man-orientated pressing, but mostly when trying to stop teams building an attack from a goal kick. The trademark of his setup is his organizing of the midfielders. His midfield is extremely narrow to prevent passes breaking their line and instead forces opponents wide. Above is an example of the compactness of Valencia when defending. The two strikers drop deep to help form an extremely compact shape to prevent teams from playing through them. The video below further emphasizes the compactness of their defensive structure as they keep the team tight and eventually win the ball before counter-attacking. As you might have guessed since they keep a very compact shape, they want the opposition to pass the ball wide where they will press aggressively. It’s usually the full-back doing the pressing as the wide midfielders tuck inside. The full-back, therefore, stays wider than the wide midfielders to maintain the access to press in the wide area. As the video example below highlights, at other occasions, when the team has closer access to the wing, it can be the wide midfielder pressing in the wide area. This is the result of Marcelino’s preference to have a really narrow midfield to stop passes breaking the midfield line centrally. We’ve already touched on it, but Valencia’s counter-attacking is absolutely rapid. They have quick players like Rodrigo Moreno, Simone Zaza, Goncalo Guedes and Carlos Soler who thrive in the attacking transition play. Add pacey full-backs like Jose Gaya, Toni Lato, Nacho Vidal and Martin Montoya and the driving force of Geoffrey Kondogbia in midfield and you get why Marcelino has his teams countering directly upon recovery of possession. There are two principles in Marcelino’s approach which are key to the success of this approach; high-intensity runs forward and quick, vertical passing forward with combinations. The first pass is always forward which means there’s a huge element of risk involved since the pass is not always safe, but it is progressive. Every counter-attack doesn’t come off, but when they do they are near impossible to stop. The first is always forward as mentioned, and if the player receiving it can’t turn and go forward himself then he combines with a player close to him with a lay-off. What’s most important is the runs made by players off the ball. The two strikers are always on the move and at least one of the wide midfielders join the attack. Below is a typical example of a Valencia counter-attack. As you saw, the move is perfect except for the final pass from Zaza. The first pass is forward, Soler continues the move with his dribbling while Rodrigo and Zaza make threatening runs and finally Soler makes a perfect pass to find Zaza. The key is the timing of the runs from the strike duo. Rodrigo, in particular, is extremely intelligent with his movement which sometimes sees him drop into positions behind the opposition’s midfield to pick up possession, but mostly with his well-timed runs in behind. The inverted movement from the wide midfielders, in the above case Guedes and Soler, creates a second line behind the strikers to be an additional option in the construction of the counter-attack. Also, their inverted movement increases the possibility to combine with both the strikers and the central midfielders, while the energetic full-backs can exploit the space wide if given the chance. This movement has helped the combination play in central areas flourish. The video below illustrates some truly terrific counters from Valencia. They can’t counter-attack for 90 minutes though, and Marcelino has some clear ideas on how to attack in build up play too. We’ve already covered the inverted movements of the wide midfielders, but we’ll look at it again here as the rotation in wide areas is an extremely important method of chance creation for Valencia. 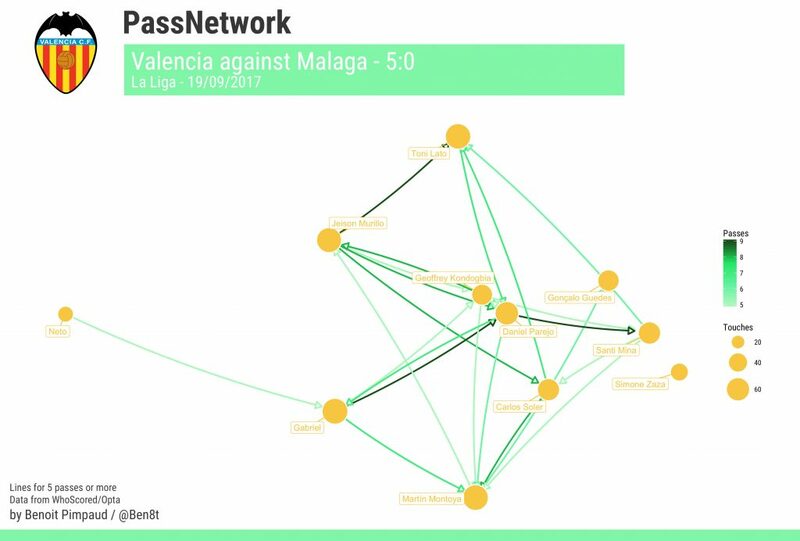 This pass map above is courtesy of Benoit Pimpaud and highlights the inverted movement from the wide midfielders Carlos Soler and Goncalo Guedes in the 5-0 win over Malaga. As is evident, the wide midfielders move centrally leaving the full-backs to attack in wide areas. They’re not stationed high and wide initially but rather attacking the space at pace when Valencia switch sides or need width to break through. The timing of full-back runs are key to the preferred method of chance creation from Marcelino; wing-play. Overlaps followed by crosses or cutbacks have been the source of most goals so far, with both goals in the 2-2 draw away at Real Madrid the result of low crosses from the left. It’s an extremely well-timed movement from Valencia which is evidently bringing rewards. They have a collection of superbly talented full-backs in Toni Lato, Jose Gaya and Nacho Vidal who fits the profile needed to fulfil these roles and the intelligence of Carlos Soler and Andreas Pereira will help play these marauding full-backs into good positions. Most importantly for Marcelino is to quickly progress the attack to create chances and goals. The video below is a good illustration as Gabriel Paulista’s pass beats the entire Real Sociedad team (which has a terrible structure) to play Guedes into space as he sets up Zaza’s winner. They always look to progress the ball and always have players running in behind. It’s tough to defend against such pace and verticality. Finally, the sample of games is small and we might be witnessing an instant reaction to a new coach after several disastrous managerial spells at the Mestalla. More likely though is the theory that Marcelino is building something extremely promising with a well-balanced squad with young players who are hungry to succeed. They fit his tactical template perfectly and given more time on the training ground they can only improve. Valencia counter with pace, they defend as a unit and they rotate well down the sides. As of now, they’ve played some of the most exciting football in Europe this season. It’s quick, it’s well-organized, it’s fun to watch and they win games. Let’s see how far it will take them.